Without knowledge of website creation programs, I myself maintain this funky home-made personal website in support of my social activism by offering the best information I can find regarding advances in science offering solutions to global and personal problems of pollutions and climate issues, energy, health, peace, justice, water, prosperity and sustainability. If you can help upgrade this website as my webmaster, let me know of your interest and qualifications! To support these efforts I am providing here information and access to vetted advanced technologies that are available now for purchase, to address such solutions, as well as continuing development research on even better ones to come. To this end, I am an independent contractor representing a couple of different companies with qualtiy products that I have used happily for years. To the extent you enable me to help you by using these products you will be contributing to the success of my overall mission to help bring about global peace and prosperity for all of our one human family. "The only ones who are crazy enough to think they can change the world are the ones who do!" Promise of Peace on Earth by Year 2021 per Mayan "Jade Princess Scroll Prophecy"
Buy a T-Shirt to support this project? 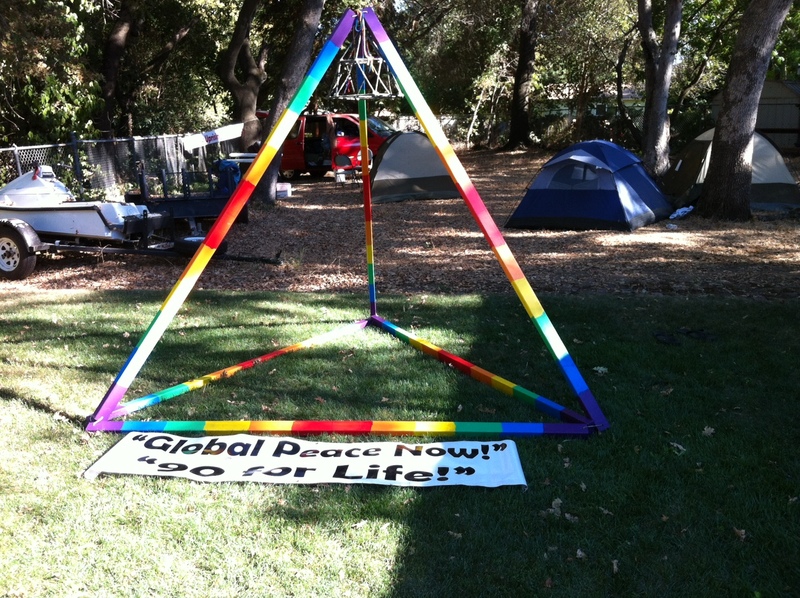 Features "Earth in Glory" logo with text: Rainbow Light - Bring World Peace"
I am the global Thrive Movement local coordinator for Santa Barbara California. My Tetrahedral Meditation Tent design, a "cell" of the "human hive experiment" as a scientific spiritual practice to unify the mind of humankind in love and peace and in harmony with the natural order. 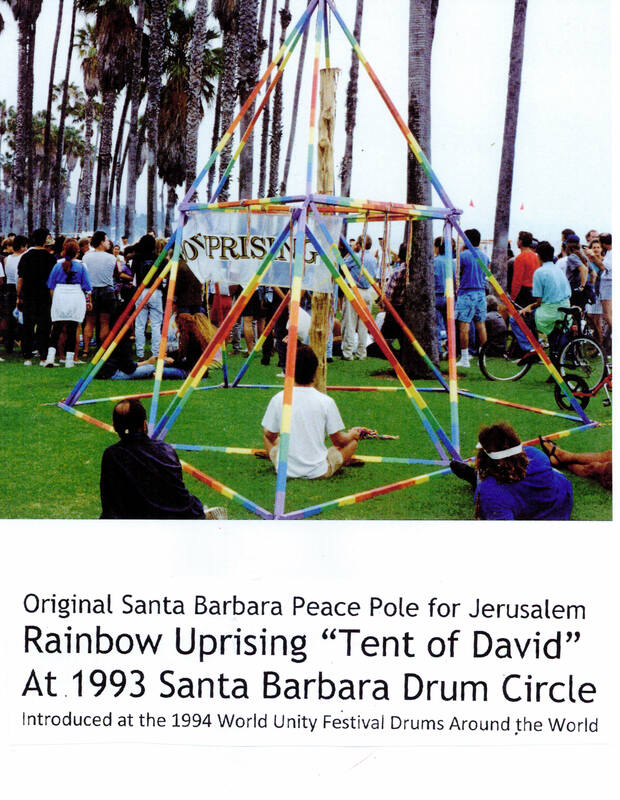 The "six unit module" meditation tent/structure lattice with a Peace Pole for Jerusalem, shown at the Santa Barbara Drum Circle in 1993. Starting Aug.3 please email Gov. 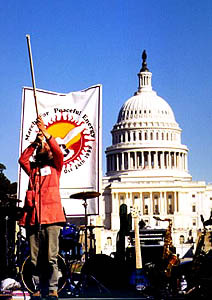 Jerry Brown asking him to accept the Rainbow Uprising of Consciousness Peace Pole Ceremony and to get the California Energy Commission to seriously investigate the suppressed clean energy technologies to replace nuclear and fossil fuel power, to neutralize radioactive wastes, and to resolve the California drought with Primary Water and/or advanced water technologies. This information has been formatted into a Gallery of Clean Energy Inventions for activists to print and laminate in three foot wide sheets at their local Kinko's to create display panels to raise awareness about these solutions. Rainbow Uprising Peace Pole Ceremony to Acknowledge The Message of Peace. 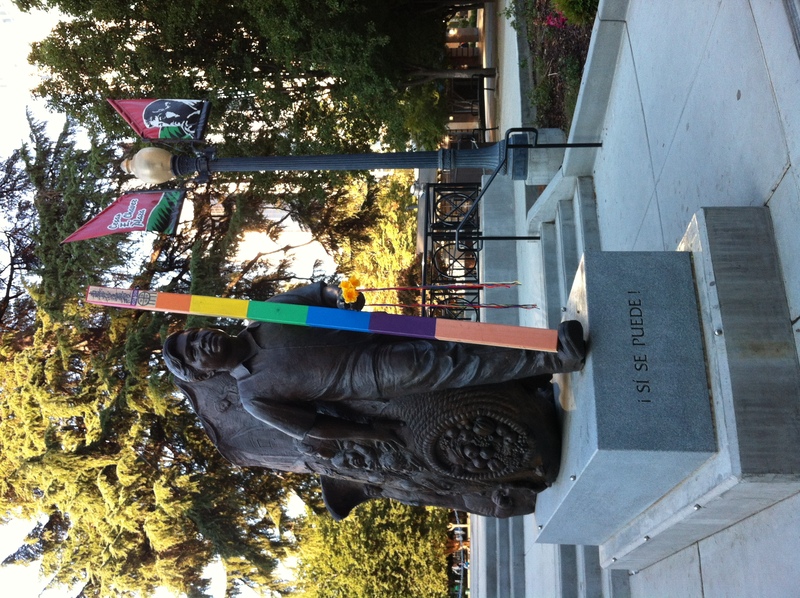 Photo: Peace Pole at Cesar Chavez Plaza in Sacramento. Join our team with The Shift Network supporting a "Global Peace Now!" Consciousness Shift, and even earn while sharing this information if you wish. My Youngevity distributor website for optimizing health and longevity while earning by sharing the related 90forLife message. My Multi-Pure USA distributor website for the best technology to ensure safe and tasty pure drinking water at home or traveling. Student and promoter of Freedom Law School for education, training and assistance to resolve government abuse issues such as IRS problems. Help make "Global Peace Now!" into a Viral Fad by freely using and sharing the Rainbow Peace Braids. After nine years living in Tehachapi California taking care of my elderly mother, in early 2007 I moved back to Santa Barbara where I had lived and traveled from since 1974 when I relocated from the San Fernando Valley in Los Angeles where I was raised and educated. After three decades of poverty, with some exceptions, as an unsuccessful volunteer activist promoting my Tetron Thesis to explain and help implement now proven revolutionary science and energy technologies, for seven years ending with my retirement in the Fall of 2013 with a small social security pension, I earned over $100k/yr as a sales manager for the leading global software service provider supporting the free and open source Moodle Learning Management System for delivering online courses, where I managed over 200 educational and corporate clients including Santa Barbara City College, Google's Legal Department, and the Bank of America. Since December 2012, I have been slowly developing a part-time home-based business with Youngevity Essential Life Sciences as a satisfied nutritional supplements user/customer and as an independent contractor to help spread the 90forLife Message of Dr. Joel Wallach DVM ND , and his Youngevity nutritional supplements for optimizing health and longevity, proven effective in eliminating over 900 diseases in vertebrate animals including humans during the last decades of the 20th Century. Unfortunately this knowledge is being suppressed by the American Medical Industry to preserve its profitable monopoly. I believe that Dr. Wallach's research at NIH CDC and his successful results since the 1970's form the knowledge base for an effective American Medical Revolution to optimize physical and mental health and longevity by providing the only complete nutritional supplements to both prevent illness and to help remedy existing health issues. To help fund my activism projects I am also offering online the world's best home water filters guaranteed, those from Multipure USA, as a satisfied customer since 1982 and as a chemist who understands the advantages of their sintered carbon block technology to remove dangerous pollutants and make home drinking water taste great. 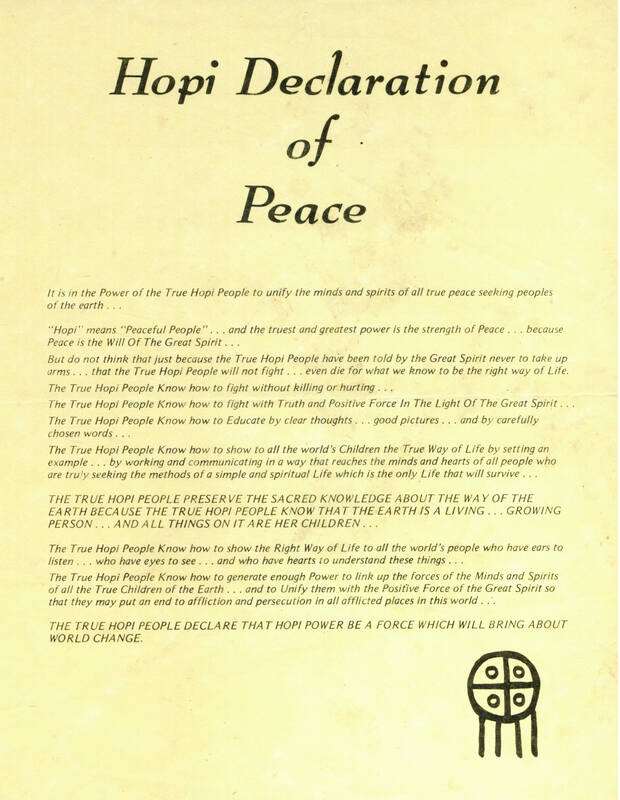 Here is a listing of newspaper articles and similar important background documents related to my (prior to 2007) Global Peace Movement work, under construction, 140 items retyped so far, and indexed by date, out of a couple hundred between 1976 and 2004. Thanks for checking out my website maintained to share the ideas and projects and programs that I have been developing and supporting for over 30 years as a global peace activist who took a vow of devotion to the cause of global peace and prosperity for all by shaving my head and face on my 29th birthday, May 17, 1974, letting it grow until shaving once again on July 16, 2006, as my symbolic commitment as a scientist (chemist) -- with a "theory" about the human mind's consciousness orientation function as an overlooked property of light -- to "the direct cause of true peace with harmony among all life and free natural abundance as paradise on Earth." This is my stated life's work since then, which is empowered by the understanding of my four "Tetron Natural Unified Field Theory" equations and the spiritual experiences that led to that mathematical understanding of The True One Law, the inviolably sovereign cosmic law and order that these equations purport to describe in the language of psychochemical physics. Tetron is my name for the human mind's consciousness orientation function of light, which is the relationship of mind between observer and observed and is defined consequent to the nature of light as the correction factor applied to the C in E=mC^2 describing how it is "pegged" to the quantifiable identity of the observer and explains the mind-matter connection mathematically. This is the "Matter Certainty Principle" antidote to the "Heisenberg Uncertainty Principle" in order to correct the mind of science into accord with The One Truth, to correct the de-facto stampeding contemporary religion of science based on uncertainty with a 21st Century American Scientific Revolution. This is the same True One Law, in my view, that is also described by the concepts and books such as those about the Torah in Judaism being the Universal Law by which all reality operates and even God must follow, about the Dharma/Karma in Buddhism - the Myo-Ho in the Medicine Word for "Global Peace Now! 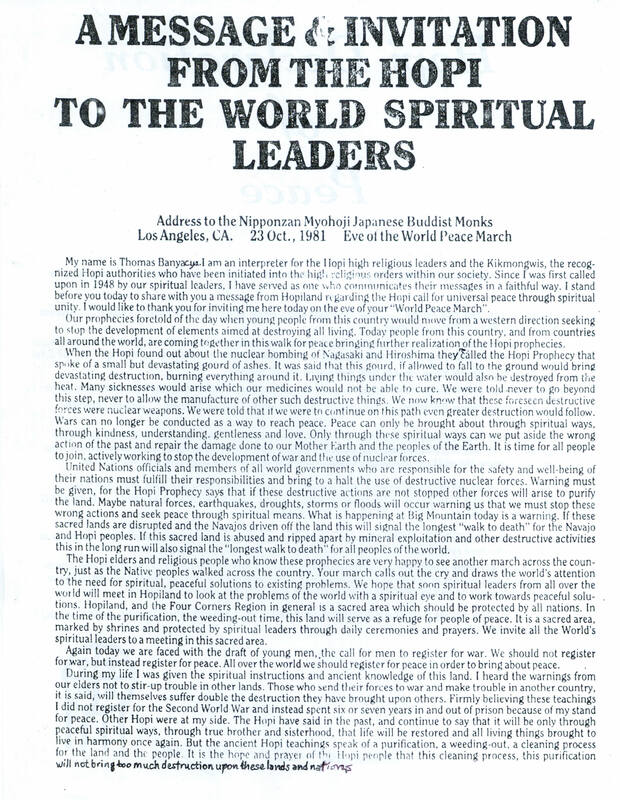 ", the Na-Mu-Myo-Ho-Reg-Ge-Kyo, about the Aoum Sai Ram of Hinduism, about The Will of The One God in Islam by which everything happens without fail by definition, about the Law of Love as taught by Jesus Christ per Sathya Sai Baba, and as per indigenous spiritual traditions described as the Law of Nature and The Great Law of Peace by the Haudenosaunee Six Nations Iroquois Confederacy after which the United States Republic was imperfectly patterned. For background information on the development of physics of consciousness theories since the 1970's, see info about the book called How The Hippies Saved Physics. Here you can read about how I got onto this path, this train of thought. Truncated 1998-2013 content of this page is here.